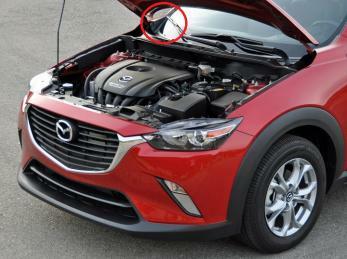 Mazda CX3 Forum > 2016 Mazda CX-3 Tech Section > Appearance & Body > Windshield Molding Part #? Hey everyone, first-time poster here. I just bought a used CX-3 last week that had some very minor cosmetic damage (ie front tow hole caps missing, etc), which I have been working to fix. One of the parts that I need to replace, I cannot find for the life of me. It's a plastic piece that attaches to the body near the hood hinges on the right side of the car. I don't know what to call it, but I've attached a photo I found that perfectly shows what I'm looking for. It's circled in red. Does anyone know what this piece is called or what its part number is? I appreciate any assistance! Thanks!